Choose one of our special packages and let yourself enjoy the nature of the island, we will do the rest. Package must be taken as a whole package. No refund or subsitutes are given for any items on the package not utilised. No Refund for early departure or incomplete stay. 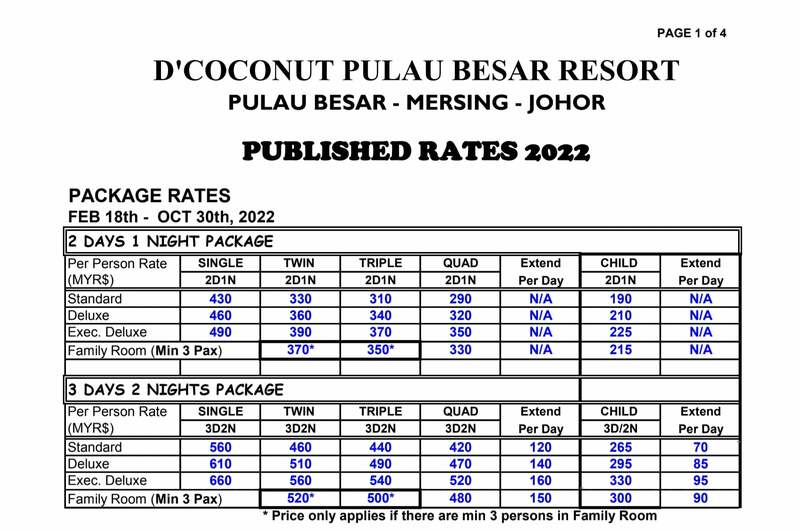 Surcharge of RM40 per person per package applies during school holidays, eves of/public holidays in Malaysia & Singapore. Refer to our Seasonality Surcharge Calendar. If extend check out time to / after 3.00pm, there will be a nominal charge of RM100 per room. *The resort will not be held responsible for any delayed on arrival due to flight delays or rescheduling, or any delay in 3rd party transportations for whatever reasons which will subsequently missed our 11.00am boat to the resort. Those who missed the boat will have to charter their own boat. *The resort will not be held responsible for any missed transport connections, whether flights, buses, train or any 3rd party transport, resulting from delays in the boat transfer arising from weather, seas, winds and tide conditions or/and due to any unexpected mechanical breakdown of the boat. Please be inform that there be a daily 3 hour power cut-off (03.00pm - 06.00pm) for the off-peak months of February, March and October. There will be 24-hours electricity from April to September unless due to unforseen and uncontrollable circumstances. *The resort reserves the right to reschedule or cancel boat timing due to sea, weather and tide conditions. © Copyright 2017. D'Coconut Island Resort. All confirmed bookings must be paid in full before the expiry of the payment deadline given. Upon the expiry of the deadline, the booking will be automatically cancelled without any further notice. NO REFUND will be made in whole or in part for any unused days or unconsumed food at the Resort resulting from late arrival or premature departure. Confirmed guests who do not show up will be charged in full and no refund will be made for whatever reasons. REVISION of rates is subject to resort discretion and without prior notice.